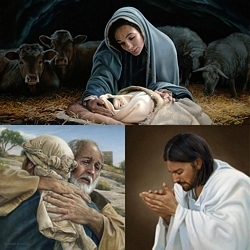 Image Size: 23"w x 15 3/8"h.
Liz Lemon Swindle portrays a Saint John's story about the divine attribute of forgiveness. Knowing that Jesus took pity on sinners, the Scribes and Pharisees tried to catch him condoning disobedience to the Law. They brought before him a woman taken in adultery and said, "Moses in the law commanded us, that such should be stoned: but what sayest thou?" Jesus stooped down, writing on the ground with his finger, as though he had not heard them. When they continued asking, he said to them, "He that is without sin among you, let him first cast a stone at her." And he continued writing on the ground. Convicted by their own conscience, they left one by one. When Jesus had lifted up himself, and saw none but the woman, he said unto her, "Woman, where are those thine accusers? Hath no man condemned thee?" She said, "No man, Lord." And Jesus said unto her, "Neither do I condemn thee: go, and sin no more." Paper edition is presented with a printed remarque, title and inscription (Hebrew and English) in the border.